Wide Open Spaces and Tiny Places – Inuktun Inspects It All — Inuktun Services Ltd.
Flashback to 2015 - Inuktun’s CEO and President, Colin Dobell, delivered a presentation at the American Society for Nondestructive Testing (ASNT) conference titled “Marsupial Miniature Robotic Crawler System for Camera and Sensory Deployment in Nuclear Waste Double Shell Tank Refractory Air Slots.” This introduction explained the challenges and outlined the requirements for the development of a robotic system that could successfully inspect inside of the air slots underneath the waste storage tanks at the Hanford site in Washington. The white paper (included at end of this post) described some of Inuktun’s Multi-Mission Modular (IM3™) technology, and illustrated how it can be adapted and customized for some of the most challenging Remote Visual Inspection (RVI) and NDT challenges. Fast forward to 2017 - we are doing it again! Come see us at the ASNT Annual Conference (only one month away!) to learn more about our products and see our IM3­™ technology in action. Inuktun InCommand Robotics, LLC, will be exhibiting at booth number 828 where we will be showing some of our standard systems, including the MaggHD™ and MaggUT™ miniature magnetic crawlers, Versatrax 50™ miniature pipe inspection vehicle, and the Spectrum 120HD™ PTZ inspection camera. Plus, we will be presenting a new paper on the Hanford tank inspection project, with updates on the latest design progress. Check back in the coming weeks for more details. Inuktun is the authority on providing big results in tiny spaces. Contact our team to learn more about our robotic crawlers and inspection cameras for confined space remote visual inspection and nondestructive testing. Even better, request a FREE exhibitor pass ($25 USD value) to the ASNT Annual Conference and discuss your requirements in person! Authors: Colin Dobell, Scott Robinson — Inuktun Services Ltd.
Beginning in the 1940s, Hanford scientists recognized a need to protect people and the environment from irradiated and chemically contaminated fuel rods. Traditional disposal methods were not possible, so they developed and built huge underground tanks to store the waste. Over time, problems with tank integrity led to leaks which, in some cases, contaminated the local groundwater. To address this problem, engineers installed more robust underground tanks with a second shell and a reinforced concrete base (“double shell tanks”) to ensure the safe storage of this hazardous material. Work to transfer the material from the old tanks into the new tanks continues to this day. The newer double shell tanks offer clear advantages over the original single shell units, but the nature of the waste stored inside mandates regular inspections of the complete tank. Inspecting the annulus area, between the inner and outer tank shell is performed regularly using remote robotic and camera systems. Although there is room for improvement in these methodologies, the current practice is effective for assessing the overall integrity of the tanks walls. A greater challenge exists with the tank floor. In other industries, tank floor inspection can occur internally – either in-situ or with an empty tank. Since these tanks cannot be emptied and inspection equipment cannot be used internally, neither option is practical here. However, the tanks are supported by a concrete foundation that incorporates refractory air slots which could be accessed by a very small remote robotic system. Integrated with video cameras and Non-Destructive Testing (NDT) tools, such a system could be effective in verifying the integrity of the tank floor. A total of 28 double shell tanks require inspection, separated into five distinct tank farms as shown in the table below. This paper describes a proposed robotic design that can be deployed through the annulus and into the refractory air slots to provide detailed assessment of both the concrete foundation and the steel tank floor. Inuktun has more than 25 years of experience designing remotely operated crawlers, cameras and robotic systems for confined spaces and hazardous environments. Although the double shell tank bottom requirements are similar to some other confined space inspection applications, the location and limited access introduce new problems that must be addressed in order for any system to be effective. No system currently available is capable of addressing all of the issues listed above but by combining some existing technologies and developing new modules and methodologies a solution can be delivered. Details on the approach to solving each challenge are summarized below. There are multiple approaches to accessing the air slots at the bottom of the tank, although any technique requires access to the annulus space through one of the available entry points in the tank dome. There are 10 risers available above the annulus, in 6, 12 and 24 inch diameters with only two each of the larger two sizes (not counting the annulus pump area, which is not being considered as a valid access point). Deployment via a pole would be the simplest and least expensive approach, but it is not viable since it would only support access to air slots directly below the risers. 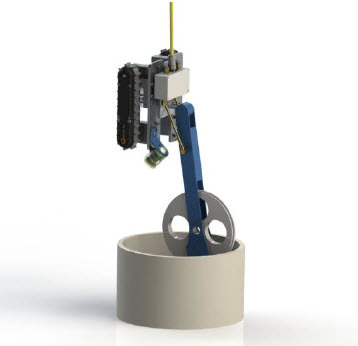 A riser mounted manipulator arm could be used to position inspection tools at all of the slots, but given the size of the tank and spread of the risers it would be extremely complicated and expensive. A more practical solution involves a marsupial approach using a larger robot (the “Motherbot”) deployed through the 12 and 24 inch risers. This larger robot would carry a smaller inspection crawler and a custom mechanism to provide positioning and cable handling. Because it offers a consistent surface that is close to the refractory air slot entry points, the inner tank wall is the most practical place to position and maneuver the Motherbot. The design of Motherbot is based on the off-the-shelf Versatrax 100 MicroMag crawler, but customized to support the additional handling equipment. The handling mechanism incorporates an articulating arm used to carry and position the inspection crawler, and a cable sheave to manage the umbilical cable for the inspection crawler. Because this mechanism is large and heavy relative to the Motherbot, it is mounted to the chassis on a loose joint. This ensures that the center of gravity is always below the magnetic vehicle thereby reducing the likelihood of separation from the tank wall, even when travelling horizontally. Once placed on the inside wall, Motherbot can be driven to a desired location using joystick or computer control. Travelling long horizontal distances away from the riser creates issues with cable weight and handling, but by utilizing all of the 12 and 24 inch risers it is possible to limit total horizontal travel requirement to less than 30 feet (based on a 75 foot diameter and 90 degree separation of the risers). Using video cameras onboard Motherbot and the inspection crawler, the system will be positioned directly above a target air slot entry point. By manipulating the angle of the deployment arm the inspection crawler can be at an ideal angle for entry into the slot. When the arm is in place, the inspection crawler can be driven independently. Moving and positioning a remote system inside of the air slots is challenging due to the size and shape of the slots themselves. As summarized in the drawings and sketches included in Appendix 1, these slots can be trapezoidal or rectangular in shape and, in some cases, as small as one inch across. The inspection crawler that will operate in the slots will be a two track system utilizing Inuktun’s new miniature crawler modules, the Picotrac™. Based on the larger Minitrac™ and Microtrac™ crawler modules, the fully sealed Picotracs™ are modular and independently operated. At just under one inch square by seven inches long, the tracks can maneuver in all but the smallest of the air slots. In addition to the confined space issues, over time, pieces of concrete have come loose and are sitting in the bottom of the air slots. This spalled material serves to reduce the effective overall size of the air slot and may make it very difficult to achieve traction or accurately position NDT sensors. Operating inside the slots while the spalled material is present would make a complete inspection almost impossible. Instead, a cleaning module can be attached to the Motherbot instead of the deployment arm. Depending on the anticipated amount of spalled material expected to be present, the cleaning operation can be performed prior to deployment of the inspection crawler or as needed upon discovery of debris. The cleaning mechanism, incorporating a push cable brush tool, will be outfitted to the same Motherbot for accessing the air slots. An on-board cable drive, using two Microtrac™ crawler modules, will be used to force a miniature push cable into the slots. When retrieved, a brush system at the end of the cable will pull the loose material out of the air slot and into the annulus space. From here the material can be removed separately through the risers or ignored. In order to ensure that loose material is not simply pushed further into the air slots, a miniature motorized mechanism will allow the brush elements to be stowed during deployment and extended during retrieval. In addition, the end effector orientation can be remotely adjusted, allowing the cable to be pushed through specific bends. If there is an excessive amount of debris, multiple passes will be required in order to effectively clean the air slot. As shown in Figure 8 and 9 below, when arranged in an in-line configuration with a miniature linear actuator between the crawler modules, the system becomes steerable through the bends between different slot types (except for the AY tanks). The figures below illustrate the in-line vehicle with on-board devices, and the travel position as it transitions through a bend. The small size of the system limits the amount of technology that can be integrated onto the crawler at any given time. Furthermore, in order to transmit video and NDT signals in real time, the umbilical cable must support reasonably high speed Ethernet or another communications protocol, or separate dedicated conductors for signals. Because the inspection crawler will have limited pulling power, the umbilical should be as small and lightweight as possible. Using single mode fiber optic cable combined with small gauge copper wires allows for an integrated cable that carries both power and sensor signals. Selecting a low friction cable jacket material (e.g. – Nylon or Polyethylene) ensures that the small vehicle will be able pull the umbilical through the full length of the air slots. As shown in Figure 8 above, the vehicle is designed to incorporate multiple video cameras and a spring loaded NDT tool that can be deployed against the underside of the tank. A specific NDT device has not been specified, but miniature sensors and transducers are available from a variety of vendors. Space constraints limit the use of mechanical pan and tilt cameras, but wide angle lenses with virtual pan and tilt through software systems will be utilized to allow inspection and monitoring. In addition, a miniature laser profiling scanner could be added to the front of the vehicle to quantify the shape and any externally visible flaws in the tank bottom. There is always a risk that unforeseen circumstances will lead to problems retrieving the systems. The best way to minimize the risk of a stuck vehicle is through a well-developed operating procedure that is followed strictly, but the design of the system components plays a big part in simplifying retrieval, especially in emergency situations. To that end, the umbilical cables for both crawler units incorporate an aramid fiber strength member allowing the systems to be retrieved by simply pulling on the cable. In addition, mechanical linkages are designed and tested to ensure that they can safely withstand the forces applied in emergency retrieval conditions. In the worst possible scenario, the small crawler vehicle fails while inspecting the innermost portion of the air slots. By keeping the Motherbot positioned at the entry to the air slot it will still be possible to retrieve the system by pulling on the umbilical from above the tank, while the cable sheave is in position. 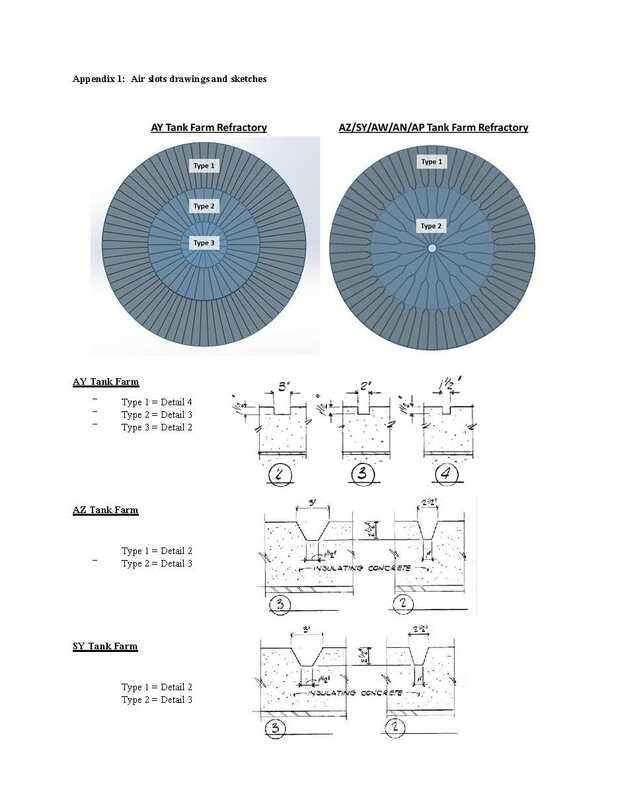 This paper illustrates how a combination of existing and newly developed remote systems and components can be used to provide reliable access into the refractory air slots underneath subterranean double shell tanks. Because of the unique entry limitations and the extremely confined spaces involved nothing currently commercially available is suitable. By building on previous engineering efforts and established design techniques the system is truly modular, allowing the addition of NDT tools, cameras, sensors and end effectors that can satisfy not only the immediate inspection requirements but almost any future remote inspection or tooling needs.